Hi! Did you end up here because you did a search for the word “tichel” or “mitpatchat” or something along those lines? Welcome! 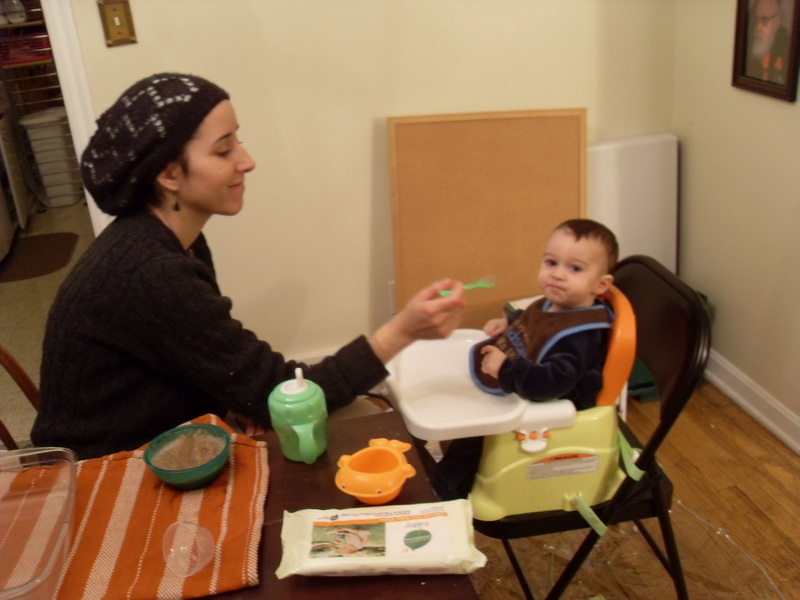 I don’t actually talk about tichels all that much on this blog, but I do talk about other things, like a lot about motherhood, a little about marriage, a lot about Jewish topics, and then some random other stuff. Since 13 or so of those hours of sheitel-wearing are on Shabbos, during the week it really feels like I don’t wear my sheitels all that often. I’m not wearing one right now. Right now, I’m wearing a comfy, floppy, easy-to-put-on hat. That’s my go-to head covering for the morning, the evening, and whenever I just don’t want to put a whole lot of effort into it. They’re not just for Renaissance fairs. The word snood has been around since about 725 CE, and they have been in and out of fashion throughout history, making a resurgence in the mid-18oos and again during the Second World War. Basically, it’s a circle of fabric with an elastic band all the way around the opening. Netted, tatted, knitted, crocheted, or knotted, they typically have a woven appearance. They can be snug to the head, or hang down a little bit. Because we want them to cover our hair, snoods worn by Orthodox ladies will have a lining in them. These are exceptionally easy to throw on, and are the epitome of comfort. You don’t need to tie them or anything. Simply pull your hair back into a ponytail bun, pop on a snood and you’re ready to head out the door. 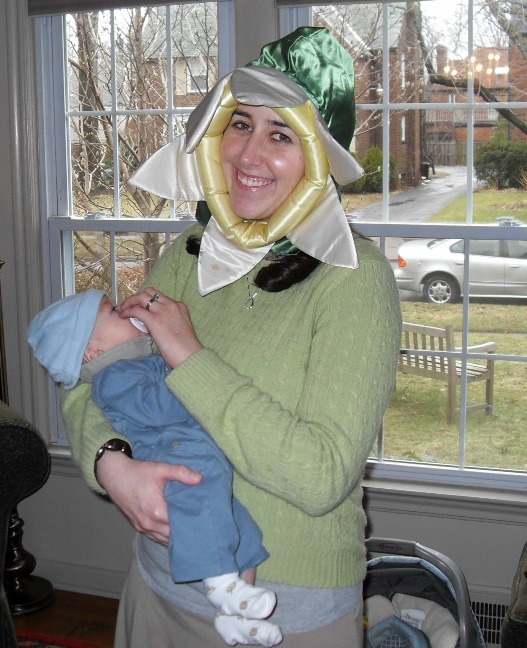 I wore snoods more when I was newly married, but my style and preferences have evolved so that I don’t wear them much anymore (no offense to snoods). However, any place where there are lots of frum ladies, there will be at least one snood. Guaranteed. Also known as mitpachot (Hebrew), they can be square, rectangular, and even triangular. Most of my tichels happen to be square, which is a great shape for tying a “classic” tichel (see video below on what that is). However, if I want to be a little fancier, or pretend to be a little Sephardi, I will choose a rectangular tichel, which I can tie in a more elegant manner. 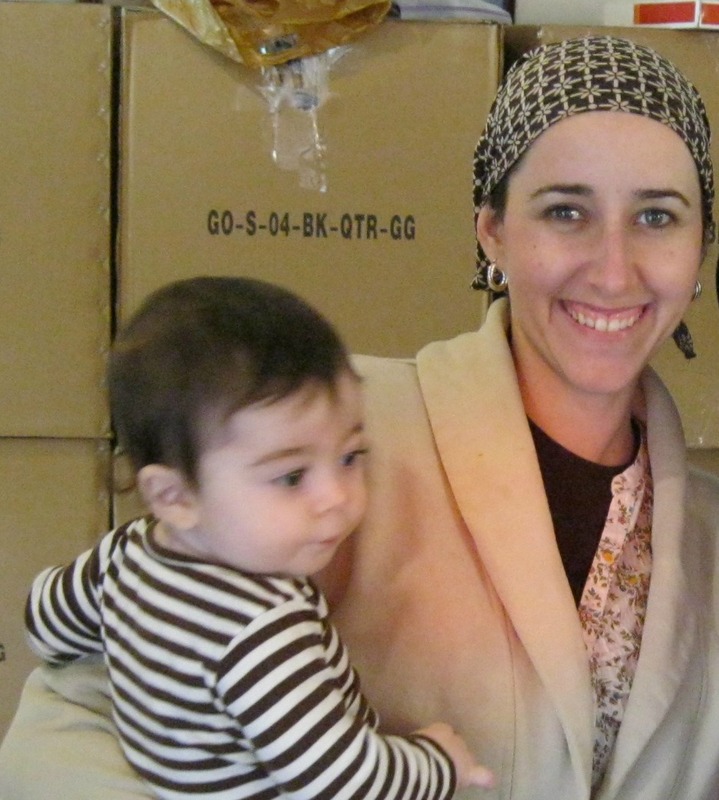 You may remember Rivka Malka from her Women Who Inspire Us post a while back. Well, she is an expert tichel-wearer, and on her website, rivkamalka.com, she has a number of video tutorials on how to tie tichels in fabulous, beautiful ways. I even got to participate in one, “The Classic,” which was appropriate as it’s the way I nearly always wear my tichels. Tichels take a slightly higher amount of effort to put on, and so I will don one when I feel like investing an extra couple of minutes in my appearance. When I do take that time, it’s a great feeling, one of elegance, grace, and a distinctly Jewish style. The downside of tichels is that when some hair starts sneaking out, it’s a little trickier to adjust them. Also, when I tie them tightly enough that they stay in place, it can be a bit tight. When they are tied too loosely, they slip back. So it’s a matter of finding the right balance. Sometimes I wear a band (a wide stretchy headband like this) underneath the tichel, which helps keep it on a little more securely, and can also jazz it up. These can range from super-fancy (think royal wedding) to super-simple. I have seen some gorgeous hats on Shabbos, which, if I weren’t a sheitel-on-Shabbos kind of girl, I would love to rock one of those fancy hats. Mostly, I opt for simple hats. For me, hats function exactly like a snood. I put my hair up in a pony bun, throw on a hat and I’m done. What I like about hats is that I feel like they have a little more personality and pizzazz than a snood, and give me a slightly more polished look without any extra effort. Also, hats are a more subtle way of covering one’s hair, less obvious than a snood or tichel. I’ve had success finding hats at H&M as well as at Target. The only downside with buying a hat at Target is that it’s likely everyone else will have thought the hat was cute, too, and bought it, and then I’m wearing the same hat as 100 other frum ladies in Baltimore. I don’t like that, so even though Target has some cute hats, I usually pass on the purchase. These are a relatively new trend (within the last four-five years, I think). Basically, it’s a tichel which is, wait for it, pre-tied. There’s a little elastic strip sewn in the back, and two (or three, depending) little tails that you can tie. Or not. I prefer to tie them. What’s nice about them is that they are as easy to put on as a hat, though they usually fit much more snugly, and hug the shape of the head. I haven’t had the best success in finding ones that I find flattering. If they’re too small, it’s like my face is gargantuan and they constantly slip back. If they’re too big, I feel like it looks sloppy and dwarfs my head. So, I have one that I will readily put on, and a couple that I will grudgingly wear. However, many of my friends look fine in pre-tieds, so it must be me, or my head, or something. Like a snood and tichel, they are a distinctly Jewish hair covering, and I don’t think anyone but Orthodox ladies wear these. What’s your preferred non-sheitel hair covering choice? Next Post Torah Tuesdays: What’s the purpose of life? I loved this post. Informational, humorous – a Rivki classic! My only question is about the chart – do the hours listed as “don’t feel like it” represent when you are NOT wearing a sheitel, or that you are wearing one against your better wishes? Also, if you don’t mind sharing, are you a ba’al tishuva? Did you grow up in the conservative movement? is it at all difficult to go frum after not being raised as such? (I’m refering to personal difficulty as opposed to that from other people) I am seriously considering it after i convert. Thanks!! There were definitely some grown pains along the way, but overall, I have a positive memory of the process of becoming frum. The level of difficulty probably also depends on the amount of support within the community as well as your level of flexibility. I’ve been frum for going on seven years, and it feels totally normal most of the time. Good luck! Great post Rifki and thanks for reading my blog too!BTW I wear sheitels in the am when I get dressed up but by PM I’m in a pretied. Can’t handle the sheitel pressure on my head all day long. A pleasure! I wish I had more time to read all the blogs I’d like to get to! Since my husband usually works during the day, I typically wear my sheitel in the evening. On the days when I’ve had a shetiel on all day, I also tend to switch to something more comfy at night. So so cute. Your blog is such a beautiful representation of frum women. Your attitude, your humor, your faith all add up to a great many posts i look forward to constantly! aww, thanks! What a nice compliment! I love this post! And seriously, even though I am Reform these days, I think a snood would be awesome on those days I just don’t want to fuss. You could totally rock that snood, Renee! And yes, it is awesome to be able to opt out of hair fuss. Awesome. your shetil posts are so great. I relate to everything you said. I usually wear my sheitl if i can’t find a scarf that matches my outfit, or if i feel like blending in (i.e. not being the ONLY sephardi in an ashkenaz sheitl-wearing crowd). i also love my berets! Your review of the different not sheitels hear covering is interesting but not complete, if I may. and you will find different gorgeous mitpachot. They are not called tichels because tichel usually apply to a basic scarf or triangles. Those are not basic, they are handmade, designed by, wait for it, french designers are really easy to tie, and make a stunning effect when worn with THE volumizer. Women don’t any more wear a mitpachat because they cannot stand the pressure of the sheitel. They wear a mitpachat because they are real fashion accessories and add a lot to your outfit. Did you ever consider assorting your outfit to your head covering and not the other way around ? This is excactly what happens with our different and exclusive designs. Feel free and welcome to direct all your readers to my page. I will be more than happy to help everybody find the mitpachat that fits her best. Thanks for stopping by Judith. The mitpachat on your page are very lovely indeed. Stanley! As usual, a great post. Good writing, humourous and very informative. I personally haven’t had much luck in the sheitel department, I’m still experimenting. I just found the Grip Band (from CoverYourHair) that I use under the sheitel and never have to use clips or combs – it’s seriously like magic. So now I’m wearing it more. Do you know where to get snoods? I know people who only wear them, but they seem to be a dying breed. Excellent! Lol, Stanley! How could I forget? I’ve heard about the grip band, and so glad it’s working for you. Since I haven’t been snood shopping in a while, I’m not sure where to get them. I assume at a head-to-hoes kind of store, or anyplace that sells frum headwear. I have seen some younger ladies here wearing snoods, but I think the hats/pre-tieds/sheitels definitely outnumber the snood wearers. I don’ t sheitel at all. The story is in chapter 18 of the haircovering book that came out a few years ago. In recent years I’ve been wearing all sorts of scarves from simple to turban and my hats are mostly croceted. I’m not a snood person, which can be described as a floppy beret. Thanks, Batya. What’s the book? I like the “floppy beret” description for a snood. That captures it well, I think. Rivkie! I read both posts and loved them. You’re so funny! Seriously, this was a great breakdown of the options and I especially loved the chart. I agree with Renee that I sometimes wouldn’t mind the option of not fussing. My orthodox friends in town always look polished. Thanks Nina! I had fun making the chart. :) It is definitely nice to have be polished without much effort. That’s probably the biggest perk I enjoy. That and the endless accessorizing possibilities. Love that! Cute, I’m reading this instead of doing homework. I liked Rivkah Malkah’s video- I will definitely check her out. haha, glad to aid in the procrastination. Rivka Malka is great. Hi, I am from Sits! I watched a movie about a young Orthodox Jewish woman, and her friend. Her friend was Middle Eastern, but they were going through some similar pains, about marriage. That is where I learned a little bit about the head coverings. I hope you are having a great day! Hi! Was the movie Arranged? I’m always a little hesitant to watch movies or anything, really, that portrays Orthodox life, but I really liked that one. I thought it had such a nice message, too. Thanks so much for stopping by! Yes! That was it! I really liked it. yes, Arranged was well made and had a great message also.. Really liked it…watched it twice! 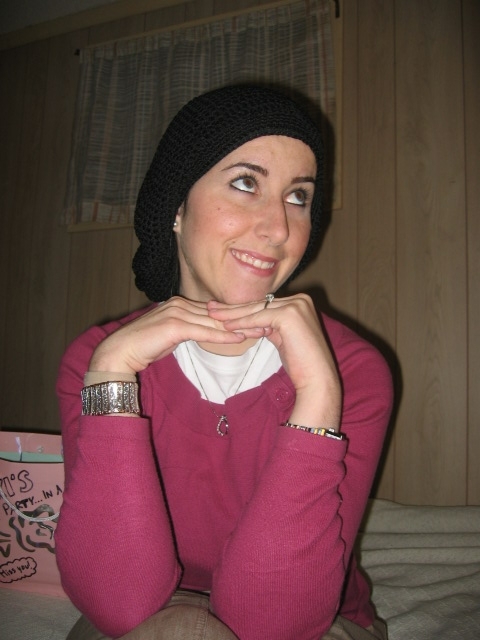 Have you ever considered wearing a wig cap under a tichel or other hat? They’re great for preventing any stray hairs. Covering hair with cloth covering full time is not only popular among Jewish women but has caught on Gentile women as well. This is all consistent with Moshiach’s coming. Join the movement. This is all almost Greek to me..I mean Jewish! I’m tracking quite well, though. I stumbled on your scarf video in search of how to wear scarves in Israel in case it is necessary for my trip in June (first time). I think I’m in trouble. My scarves are large but can be folded and I’ve created multiple ways to wear them nicely, but I think people will wonder, “where the heck is she from? !” I’ve got some practicing to do so thank you for the wonderful, sweet video. 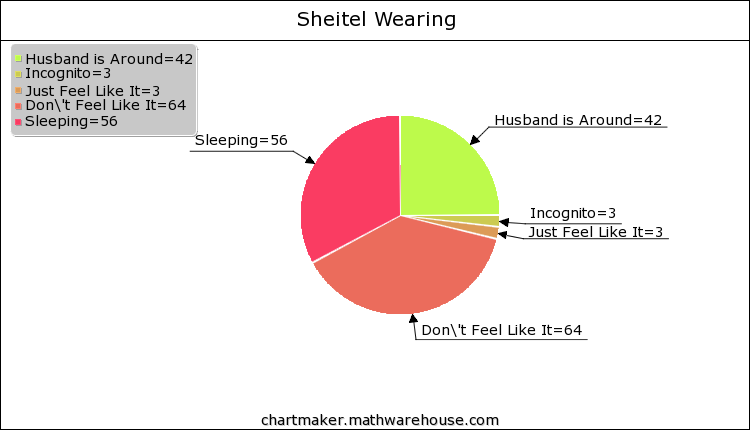 I was just interested to know in the chart where you said fluid wear the shietel when your husband is around. Does that mean your husband doesn’t see your actually hair either ? Also, does everyone who wears a shietel shave their head? Hi! Great questions! My husband and my kids see my hair, just usually not until I’m ready to go to sleep or first thing in the morning.